It has been rather fun to design a line of stencils with one of my most favorite motifs - houses! 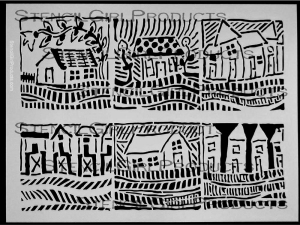 There is one stencil with 6 houses on it, available through Stencil Girl Products. The link is below! So exciting! Silver paint on Orange! More designs and a whole slew of projects ahead! Those look wonderful with the houses. I do have stencil mylar, but have a hard time cutting it with my hands. What do you do to make your stencils? Love your stencil designs... beautifully done! Tempted to order some, but will wait till I get back in town.. Sure they will be a big success.